Deciding whether or not to undergo laser hair removal treatment is a decision that takes a bit of time and effort to make. Prior to choosing whether or not removing your unwanted hair with lasers is right for you, it would be a good idea to weigh all of the options. It’s important to understand how lasers remove hair and what you can expect if you book a laser appointment for hair treatment. Lasers are more effective than standard at-home hair removal techniques, such as shaving, because the lasers can treat each individual hair in its entirety. While many home treatments that you may try can cut or shave off the part of the hair that you can see, most don’t pull out entire hairs, and those techniques that can, such as removing hairs with tweezers, can be painful or time consuming. When you go in for a laser hair removal appointment each whole hair in the treatment zone will be targeted and removed by the laser device right down to the root, increasing the time it takes for the hair to grow back, often by fifty percent or more. It is important to understand that laser hair removal tools generally target surface hairs by identifying dark zones against a light background (the skin). While some lasers can also target hair that is not even showing above the skin’s surface, it is important to choose the type of laser you are going to be treated with carefully. That choice should be made by your skincare clinic’s staff, who will be able to assess your needs based on the type of skin that you have. You should also be aware that lasers are immune to some of the problems that we, as people, face. For example, lasers do not accidentally miss hairs. They are carefully calibrated devices which target each hair with accuracy you cannot possibly duplicate at home. That is another reason why people choose laser hair removal treatments, as opposed to waxing or shaving. 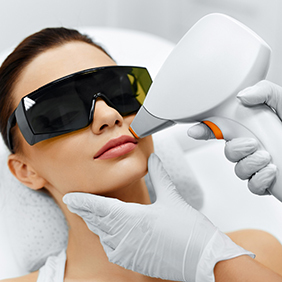 In general, most laser treatment side effects, such as blistering or burning, can be avoided by having your skin assessed by your clinician during a consultation appointment prior to your first treatment. During the consultation your clinician will make note of your skin type and explain to you why certain laser treatments may or may not be right for you. For example, if your skin is excessively oily then your clinician may recommend that you avoid certain laser devises, which might cause burns or blisters on your skin’s surface. Despite having a consultation before your appointment, you may still encounter mild side effects of laser treatments. The procedure itself can be a little bit uncomfortable and cause your skin to feel warm. If the warmth is excessive, ask your technician to stop and address the problem. After your treatment you may also find that your skin will be red for a short time, but the redness should fade within a day or so. Finally, keep in mind that laser hair removal is usually done more than once. In fact, your clinic may ask you to schedule several appointments at once as a series. It takes multiple treatments for the hair follicles to become damaged enough to get rid of the hair and slow down the regrowth process. You may also wish to schedule additional laser hair removal sessions at some later date when the hair does finally grow back.